Quandong Geeky Facts and information vary & most people who have already heard about the Quandong automatically think of the Red "Bush Quandong" Santa lum Acuminatum , but now you know there are more varieties than just the semi famous one out there . Even though these other supposed Quandongs may not all be of the Santalum genus its interesting to see what people have named things over the years. Elaeocarpus angustifolius also know as the Blue Marble Tree , Blue Fig , & the Blue Quandong . These puppies can grow up to 50 meters tall very unlike the popular red desert quandong which would be lucky to reach 6 or 7 feet. The Blue Quandong is a pretty sour fruit i think but some people say its crossed between a young peach like flavour , but because conditions of growing and there are no specific cultivars one fruit may taste great and one from another location in the wild may taste not so great . The native animals love it such as cassowaries , native pigeons & flying foxes . The Cassowarie which is becoming more and more scarce actually eats the fruit whole that has fallen to the forest floor and the seeds pass through and then are in an ideal state to re grow new trees . I can remember getting caught off guard by this little fella ! 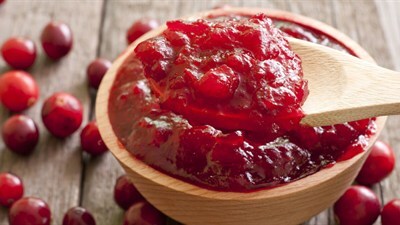 The Santalum murrayanum looks tasty when its red but i tell you know you'll pull a funny face after you try it raw . But by all means it makes a great cooking ingredient . as with many other Quandong derivitaves the tree it grows on is semi parasitic and relies on its roots to grab nutrients of other nearby plant systems . 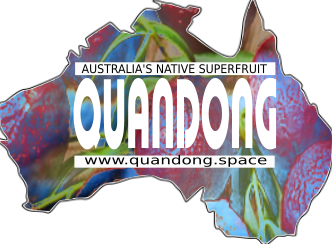 Quandong is a tree growing in all Australian States. Aboriginal names are; Bidjigal, beeticul, dumbari, gudi gudi, gutchu, guandang, jawirli, qandang, quandong, mangata, walku, wanga, wongil, wajanu and wayanu. 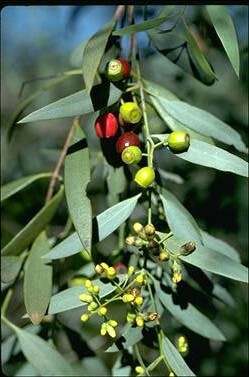 Quandongs are a bush food used by indigenous Australians, then also by the early pastoralists. Today contemporary cuisine is widening use of the quandong. The bright red fruit has white or cream flesh and a tart, almost bitter flavour, but is also known as the ‘desert peach’. The best fruit have a good balance of its acid and tannin flavours. Fresh fruit can be obtained in some locations, the large seed needs to be removed and the skin may also need to be peeled off. 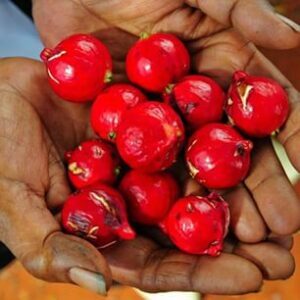 Quandongs are also able to be frozen, but like many bush foods you are more likely to find them dried or in packaged foods. Remember though it is illegal in Australia to take large amounts of Quandongs from the wild. The dried and frozen fruit are sold as halves with the seed removed, and retain their flavour for many years. The seeds can be roasted and some say they have an almond like quality , Mostly though the seeds are used for jewelry and would have ones been used as toys for native Australian kids . There have been several attempts to commercialise the crop but as the plant is semi parasitic it requires a host plant to grow off . Quandong ~ does it have a future ? Commercialisation began 30 years ago and since 1973 CSIRO Australia is researching improved commercial cultivars , mm so hurry up already ! With so many cooking shows on television i thought someone would have already picked up on this ????? ?